A water-deficit period, leading to stomatal control and overexpression of protective proteins (sHSP and DHN), contributes to olive´s tolerance to later imposed stress episodes. Aquaporins modulation is important in olive recovery. Olive is traditionally cultivated in dry farming or in high water demanding irrigated orchards. The impact of climate change on these orchards remains to unveil, as heat and drought episodes are increasing in the Mediterranean region. To understand how young plants face such stress episodes, olive plants growing in pots were exposed to well-irrigated and non-irrigated treatments. Subsequently, plants from each treatment were either exposed to 40 °C for 2 h or remained under control temperature. After treatments, all plants were allowed to grow under well-irrigated conditions (recovery). Leaves were compared for photosynthesis, relative water content, mineral status, pigments, carbohydrates, cell membrane permeability, lipid peroxidation and expression of the protective proteins’ dehydrin (OeDHN1), heat-shock proteins (OeHSP18.3), and aquaporins (OePIP1.1 and OePIP2.1). Non-irrigation, whilst increasing carbohydrates, reduced some photosynthetic parameters to values below the ones of the well-irrigated plants. However, when both groups of plants were exposed to heat, well-irrigated plants suffered more drastic decreases of net CO2 assimilation rate and chlorophyll b than non-irrigated plants. Overall, OeDHN1 and OeHSP18.3 expression, which was increased in non-irrigated treatment, was potentiated by heat, possibly to counteract the increase of lipid peroxidation and loss of membrane integrity. 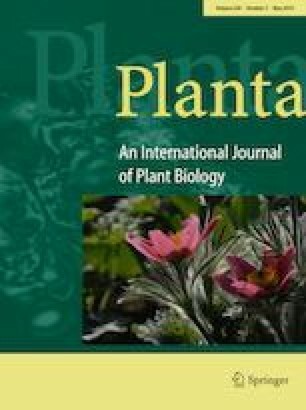 Plants recovered similarly from both irrigation and temperature treatments, and recovery was associated with increased aquaporin expression in plants exposed to one type of stress (drought or heat). These data represent an important contribution for further understanding how dry-farming olive will cope with drought and heat episodes. The online version of this article ( https://doi.org/10.1007/s00425-019-03109-2) contains supplementary material, which is available to authorized users. This work was financed by FCT/MEC through national funds and the co-funding by the FEDER (POCI/01/0145/FEDER/007265), within the PT2020 Partnership Agreement, and COMPETE 2010, within the projects UID/AGR/04033/2013, UID/BIA/04004/2013, UID/MULTI/04378/2013, UID/QUI/00062/2013, and UID/QUI/50006/2013. Institution CITAB, for its financial support through the European Investment Funds by FEDER/COMPETE/POCI—Operational Competitiveness and Internationalization Program, under Project POCI-01-0145-FEDER-006958 and National Funds by FCT—Portuguese Foundation for Science and Technology, under the project UID/AGR/04033/2013. In addition, FCT supported the doctoral fellowship of M Araújo (SFRH/BD/116801/2016), the contract research of MC Dias (SFRH/BPD/100865/2014), and of José Miguel P. Ferreira de Oliveira (SFRH/BPD/74868/2010) through POCH/FSE. The authors would like to thank JCLopes for the English revision of the manuscript.